Since early Japan Inari was seen as the patron of business, and merchants and manufacturers have traditionally worshipped Inari. 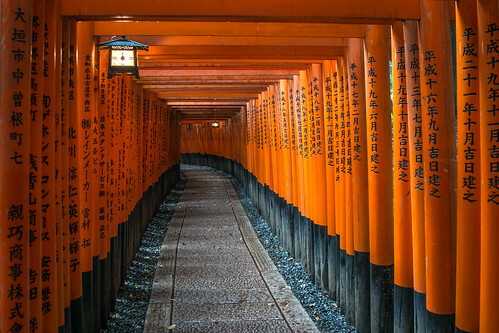 Each of the torii at Fushimi Inari Taisha is donated by a Japanese business. First and foremost, though, Inari is the god of rice. This popular shrine is said to have as many as 32,000 sub-shrines (bunsha (分社?)) throughout Japan.Fushimi Inari Taisha (伏見稲荷大社?) is the head shrine of Inari, located in Fushimi-ku, Kyoto, Japan. The shrine sits at the base of a mountain also named Inari which is 233 metres above sea level, and includes trails up the mountain to many smaller shrines.